I planted giant sunflowers in the back of the vegetable garden this year, just on a whim to see if I could provide some “natural” food for the birds. The plants did indeed become gigantic — more than 12 feet tall (see Sept 2 post). The flowers were about 8 inches across, and attracted a variety of pollinators, but were most attractive to the bumblebees (one is working on the giant sunflower below). Unfortunately, it wasn’t the birds who discovered the maturing seed heads, it was the squirrels, who were climbing the stalks and pulling the flowers over and eating them. So, I had to harvest the flower heads a little early, before the seeds in the center had a chance to mature. Even though slightly immature, these seed heads were enormous (compare with camera lens cover). You can see the squirrel damage on the flower on the left. Some of the disk flowers had not dropped off yet, but there were maturing seeds underneath. These flowers are a testament to the pollination efficiency of those bees, as illustrated below (with disk flowers removed). If there ever were a demonstration of the eco-service provided by bees, this has to be it. It looks like almost every single one of those disk flowers got pollinated and fertilized and has at least tried (less successfully in the center) to produce a seed. 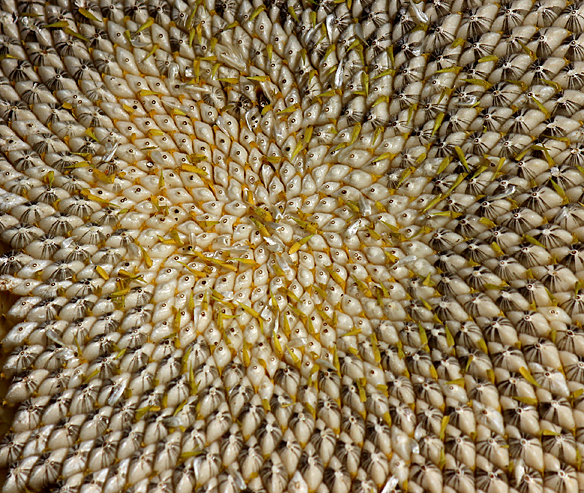 You can see the beautiful geometric pattern of spirals that promotes the most efficient seed packing into limited space (read about the “golden angle” in the post on Sept 2). But just to drive the point home, here’s a close-up. So you can better appreciate the geometric spiralling pattern, I drew on the seed head to help me keep track while counting seeds. Yes, counting the seeds, because I wanted to know how many seeds were in a 6.25 inch diameter sunflower seed head. Now, here’s the interactive part of this post. How many seeds do you think there were in this seed head? 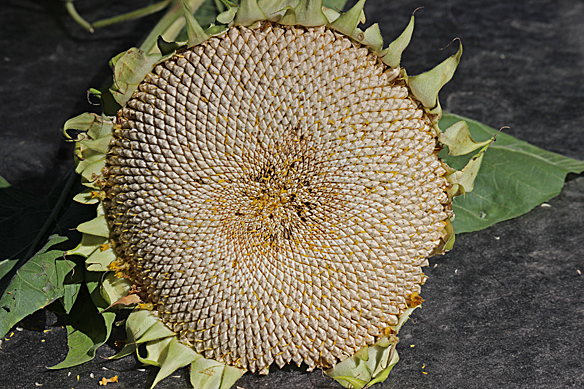 This entry was posted in Fruit-Flowers, Plants and tagged Fibonacci sequence, giant sunflower, golden angle, Helianthus, seed head, sunflower seeds per flower by Sue. Bookmark the permalink. Using no scientific method at all, I’ll guess 5,000 seeds. Good try, Mike. You are closer than anyone else so far. Very close — good guess. I’m guessing 2000, but really haven’t a clue. Hi Amy, thanks for visiting and making a guess on the seed head. Apparently I never gave the right answer to the question i posed. There were only 1080! Much lower than expected because of all the undeveloped seeds in the middle of the flower. 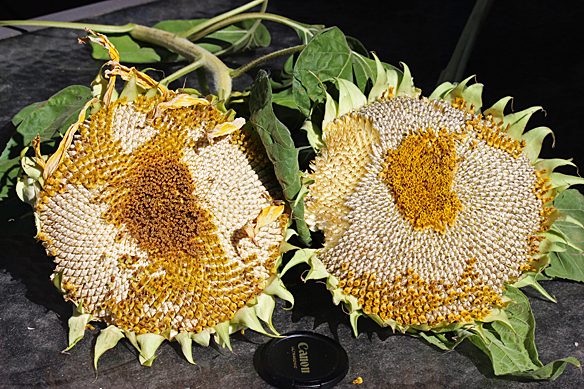 Were you able to determine a model or any link between spiral count, head diameter and seed count? EG; number of spirals by spiral length, or seeds per diameter inch. 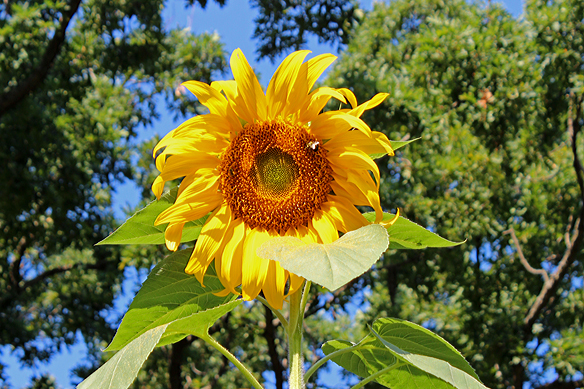 To avoid squirrels harvesting for you – you could put a paper bag or fasten some cheese cloth over the head of the sunflower plants once the petals start to die off. This allows the seeds to finish maturing without having to race against birds or critters from harvesting for you.